Dana Reynolds is Bishop of the Western Region of Roman Catholic Womenpriests. She is a spiritual director and writer who has been a facilitator of the spiritual/creative process for over twenty years. Dana believes that God speaks to us through the world of images and symbols and that we are invited to be co-creators with the Divine through our sacred imaginations. Visit her weblog where you will find inspiration and tools for enlivening your spiritual practices. Yours are the eyes through which Christ looks with compassion into the world. ours are the hands with which Christ blesses the world." St. Teresa of Avila, a prominent reformer of the Carmelite order, was interrogated by the Inquisition for her teachings on prayer. She is a patron for Catholics, who have been excommunicated, interdicted , and/or condemned by officials in the institutional church. St. Teresa, may we live as you did, as Christ's presence in our world. In my book, Praying with Visionary Women, I write about holy women:mystics, prophets and activists in the Christian tradition. Wenn es bei Lefebvrianern und Holocaust-Leugnern möglich ist, dann soll es auch für Frauen gehen: Die Aufhebung der Exkommunikation der vier traditionalistischen Bischöfe der Piusbruderschaft hat auch Hoffnungen am anderen Ende des katholischen Spektrums genährt, wie Kathpress meldet. Die Organisation "Roman Catholic Womenpriests" (RCWP) forderte jedenfalls Papst Benedikt XVI. auf, jetzt auch das Dekret über den Ausschluss ihrer eigenen Mitglieder aufzuheben. The Catholic Network for Women’s Equality (CNWE) calls on Pope Benedict to lift in a gesture of reconciliation toward women in the Church the decree of automatic excommunication issued on May 29, 2008 against all Roman Catholic Women priests or bishops. We are aware that the Congregation for Bishops, instructed by the Pope, removed the excommunication of four dissenting bishops on Jan. 21, 2009 for the same reason of promoting Church unity. Michele Birch Conery, Marie Evans Bouclin, Therese Koturbash, Paula MacQuarrie, Jocelyn Rait. This week Dorothy Irvin, distinguished Roman Catholic Theologian and Archaeologist and I had a conversation on the role of bishops in the early church. 1 Before Constantine, Christians met for worship in the homes. 2. The bishop's home was a gathering place for worship, meal sharing, distribution of goods to the indigent. There were multiple house churches in Rome. Hence, bishops originated in the house churches. 3. 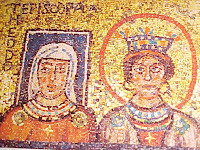 In mosaic above in St. Praxedis Church in Rome you see depictions of two women bishops, who lived 600 years apart, St. Praxedis and Theodora. 4. The church of St. Prisca and Pudentiana were early house churches. 5. After 325 A.D., when Christianity became legal, the pagan temples were turned into churches, worship moved from the homes to public buildings. 6. The bishop became a government official/ a magistrate. The diocese was a civil division like a county and the bishop had a territory to administer. 7. The Vatican still assigns cardinals as titular heads to what were formerly house churches in Rome. I find this interesting as Roman Catholic Womenpriests elect bishops. Some of us originate in contemporary house churches! Today, Feb. 1st is the feast day of St. Brigit of Kildare, (born 450AD) who according to the Irish Life of Brigit was ordained a bishop. Bishop Mel argued: "But I do not have any power in this matter. That dignity has been given by God to Brigit beyond every other woman. Only this virgin in the whole of Ireland will hold the episcopal ordination." Bishop Mel seemed to say that only the abbesses of Kildare could be ordained bishops. 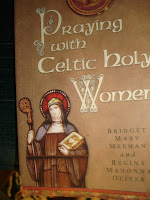 Brigit's successors would have high level authority in the Irish church. Indeed other Irish bishops customarily sat at the feet of Brigit's successors until the Synod of Kells ended this tradition in 1159.